On 6 July 1942, Anne Frank and her family were forced to go into hiding in Nazi-occupied Holland. Why did Anne and her family need to hide from the Nazis? Hitler, the leader of the Nazis, wanted to create what he saw was the perfect German, this meant that anyone who did not fit into his perfect image was persecuted (ill treated) and/or killed. Hitler persecuted German citizens who were Jewish, Gypsies, or otherwise "undesirables". Anne and her family were Jews. 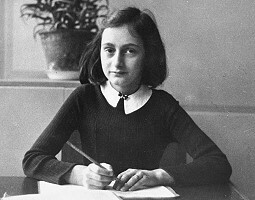 Anne Frank is well known because of her diary. In the summer of 1942, Anne began a diary relating her everyday experiences, her relationship with her family and friends, and observations about the increasingly dangerous world around her. What happened to Anne and her family? On 4 August 1944, the Nazi Gestapo discovered the Frank's "Secret Annex." The Franks were sent to the Nazi death camps. Anne ended up at the Auschwitz concentration camp in Poland. Anne's diary was left behind, undiscovered by the Nazis. In early 1945, with the Soviet liberation of Poland underway, Anne was moved with her sister, Margot, to the Bergen-Belsen concentration camp in Germany. Suffering under the deplorable conditions of the camp, the two sisters caught typhus and died in early March.